"Water cannot be alkalized. It is the material in the water that makes it alkaline or acidic. Water is a poor conductor of electricity and is not prepared to hold a charge. While the presence of or absence of hydrogen atoms controls acidity and alkalinity, hydrogens are neither accepted nor donated by water. Otherwise it would no longer be water. Deuterium oxide , for example, is not water. Drinking it will not kill you, but neither will it hydrate cells, and you will die from dehydration, although your thirst might be slaked. Adding an oxygen to water yields hydrogen peroxide, which if left exposed to air, will lose that oxygen and revert to water. That is the reason behind the brown bottle. If a person wants 'alkaline water', all he needs to do is add Alka - Seltzer or baking soda. Minerals by nature are alkaline. Whichever ones you add to water will alkalize the beverage, but water is still water. If your goal is to provide an alkaline environment inside the body, let the pancreas do it. That organ makes bicarbonates in response to the introduction of acid. This is the rationale behind drinking lemon - or otherwise acidulated - - water. Citrus is an acid perse, but causes the pancreas to change the environment. What's more, the acidity of the stomach has a pH of 1-2. It would take lye, at pH of 14, to alkalize that. Alkaline water, if there could be such a thing, does nothing. Look for the studies. I have never found one. It is what is in the water that alters pH. Liquid minerals for example." Q: What's in EON-H Water? A: Nothing! EON-H is still H2O. What makes it so special is that the hydrogen bonds are now realigned to form smaller, more consistent water clusters that provide the body with superior hydration. This makes our water "thinner and wetter." Q: How much do I need to drink each day? A: Most people can meet their basic hydration requirements with two bottles per day. Two bottles of EON-H are equivalent to four or more equal-sized bottles of spring water! Q: Can I use this water to supplement my regular brand of water? A: Absolutely. 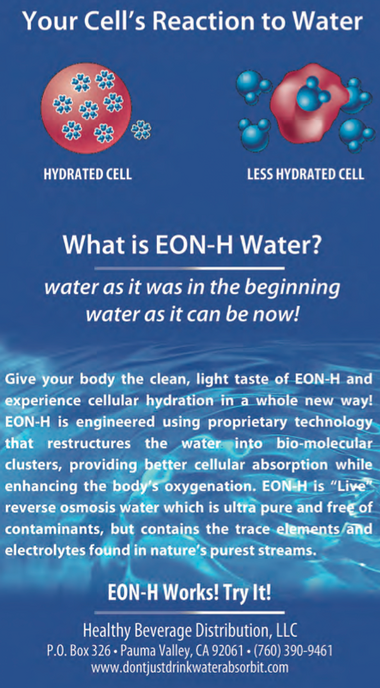 Drinking EON-H ensures that more water is actually penetrating the cell and increasing intracellular absorption. Q: I notice that I have to use the bathroom about twenty minutes after drinking EON-H. Why? A: EON-H causes a rapid fluid mobilization, which flushes out cell water that is bound with wastes and toxins, replacing it with fresh, unbound oxygenated, hexagonally structured water. Q: Can I cook with it or make herbal teas? A: Yes you can! The structures inside EON-H are impervious to both hot and cold temperatures. In fact, EON_H will enhance the flavor and potency of hot and cold beverages. Q: Can I simply drink more spring water to become better hydrated? A: Most spring water is only 15-35% absorbable. Why drink 8-10 glasses of inefficient spring water, when you can drink 4-5 glasses of EON-H and get the same hydration? With EON-H you can drink half as much and get more than twice the fluid absorption! Q: Can I use EON-H to take my vitamins and supplements? A: Most definitely. EON-H water will increase the absorption and bio-availability of all nutrients, because they are being transported into the cells with structured water-the body's ideal delivery vehicle. Q: Is EON-H created artificially? Why not just drink water that comes directly from Nature? A: EON-H IS completely natural! Our water duplicates and recreates similar natural energetic forces found in a handful of select, healing springs throughout the world. Water found in these springs cannot be transported, without losing its energetic structure. We have developed a patent-pending process to stabilize these energetic attributes, so that you may experience the healing benefits of magnetized, structured water, direct from the bottle. Safe, Pure, Powerful; As Nature Intended.